My studio is growing with more and more analog synthesizer modules in the eurorack format. Why? Because they sound fantastic. But more important: the approach is much more musically than working via a computer screen. It is an instrument and you need to learn how to play it. So I also decided to give analog visuals a try. How? 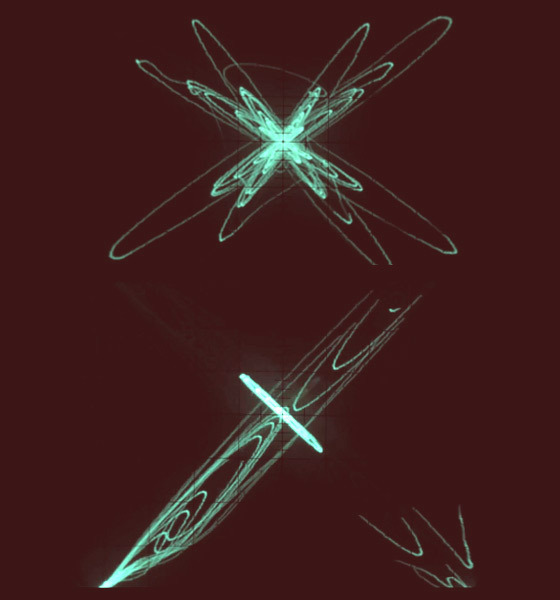 – Well, in a very direct approach – with a good old analog dual oscilloscope (x/y Lissajous figures). No latency at all and almost infinite resolution. Nevertheless the cam to capture it has to be digital – no way to go back to PAL or NTSC there. …and if you think: Hey, that reminds me off an atom, or a galaxy, or a sun exploding – then you are damn right. Analog Audiovisual Structure.